The quality of cannabis flowers is massively important, but the quantity is also a key factor to ensure you have a stash to last a while. These 8 strains tick both of these boxes and many more. Growing cannabis can be a long process; it takes determination and an eye for detail. There is potential for many hardships along the way, such as pest infestation, plant disease, and deficiencies. For these reasons, it's worth striving to obtain the best end result possible, and a lot of that starts with the genetics you begin the process with. Several strains are genetically equipped to produce large and heavy harvests. These strains are the best choices for growers seeking large quantities in return for investing their hard-earned money and time. Here are the top productive Zambeza cannabis strains. White Widow Haze is the result of a breeding program that set out to merge world-famous White Widow genetics with the ever-potent Haze. The end product is a sensational sativa-dominant lady that features the very best of these two powerhouses. The high is extremely potent, taking the strength of White Widow and combining it with the cerebral euphoria of Haze. This strain produces THC levels of 20% and a high that boosts the cognitive processes of the mind, increases focus, and enhances alertness. Blazing this strain before creative endeavours will certainly increase work quality. This impressive high is also coupled with tantalising scents and tastes of tropical fruits and sugar. When it comes to productivity, White Widow Haze is the first port of call for many growers. This beast is capable of putting out between 500–550g/m² indoors whilst maintaining heights of between 80–110cm. When grown outdoors within garden beds or pots, she can produce up to 700g/plant whilst growing to towering heights of 300cm. White Widow Haze will provide heavy harvests after a flowering period of approximately 65 days. When you’re looking for a strain to produce scale-tipping harvests, of course you would keep an eye out for the letters “XXL” in its name. Well, they are there for a reason. This strain was bred to pump out large yields and to do so in a relatively short time frame. She gets her strong and productive genetics from powerful parent strains Afghani and Skunk. This mix results in an indica-dominant strain that offers a stoning and relaxing high that is ideal for rest and downtime. THC levels of 19% aren’t to be taken lightly, contributing to a fast-acting and long-lasting experience. This soothing high is coupled with tastes and smells of skunk, sweetness, and spice. Critical XXL is a pleasure to grow both indoors and outdoors. Regardless of the growing environment, be sure to provide support for this lady in the form of stakes or netting when her dense and heavy flowers begin to form. When growing her indoors, expect yields of between 550–650g/m² and heights of up to 150cm. When growing outdoors, get ready for yields of up to 750g/plant and large heights of up to 230cm. Critical XXL features a rather rapid flowering time of around 50 days. OG Bubblegum derives from a sensational relationship between the fruity superstar Bubble Gum and the potent icon OG Kush. This merging of genetics has given rise to a strain full of flavour that’s generous in its productivity and effect. The indica dominance of this strain makes for highs that are deeply relaxing, potent, and euphoric. OG Bubblegum has the ability to transform a stressful day into a blissful evening. Both OG Kush and Bubble Gum are known for their sweet aromas, which means OG Bubblegum is bursting with impactful smells and tastes of fruit, berries, and sweetness. A THC content of 19% allows for instant highs that will redden the eyes. OG Bubblegum offers large yields of dense and compact flowers. Indoor plants pump out harvests of 600g/m² and grow to heights of between 100–130cm. Outdoor crops offer very respectable yields of 650g/plant and are capable of reaching 200cm in height. Outdoor plants will be ready to harvest at the end of September. OG Bubblegum has a flowering time of approximately 55 days. Skunk is a true pedigree strain that has been the foundation for some of the most potent and famous hybrids available today. These first-class genetics are the result of parent strains Super Skunk, Acapulco Gold, and Colombian Gold. This lineage has created a genetic balance consisting of 75% sativa genetics and 25% indica genetics. This potent lady emits pungent aromas of sweetness, fruits, and skunkiness. Although she offers rather moderate levels of THC and CBD, the high is still hard-hitting and sustained. It’s more of a body high that soothes the muscles and calms the mind. Skunk is a heavy producer in both indoor and outdoor environments. Indoor plants can be expected to pump out yields of approximately 500g/m², growing to heights of between 100–120cm. Plants cultivated outdoors produce good yields and grow to heights of up to 200cm. Skunk has a flowering time of 7–8 weeks. Much like most autoflowering varieties, White Cheese Autoflowering maintains a short and compact size that is ideal for small indoor spaces, as well as discreet growing operations. However, don’t let her size fool you. White Cheese Autoflowering is capable of producing rather massive yields considering her stature. This little beast was created using parent strains White Cheese and a ruderalis variety. This mix forged an indica-dominant strain with THC values of 16%. The highs are noticeably relaxing and therapeutic. White Cheese Autoflowering is easy to grow and requires little maintenance. Indoor plants will provide an impressive 400–450g/m² whilst maintaining easily manageable heights of 60–90cm. Outdoor plants grow to varying heights of 50–120cm and put out great yields of 150–220g/plant. White Cheese Autoflowering is a speedy specimen that bursts from sprout to harvest in as little as 60 days. This is one special strain that is the end result of introducing the beast that is White Widow XL to the autoflowering world by breeding it with a ruderalis variety. If the potency and yield of White Widow XL wasn’t enough, now those genetics are available in an easy-to-grow autoflowering form. White Widow XL Autoflowering is a sativa-dominant lady that gifts clear-headed and pleasant highs to its users. With THC levels of 15%, this strain hits the sweet spot between not being satisfied and being too high. White Widow XL Autoflowering grows to heights of around 100cm both indoors and outdoors, yet puts out some fantastic yields. Indoor plants can deliver 500g/m², whereas outdoor plants will reward growers with up to 250g/plant. Plus, she’ll be ready to harvest around 70–85 days after sprouting. Northern Lights XL Autoflowering is one of the highest-yielding autoflowering strains on the market. This girl has a classic lineage involving widespread favourite Northern Lights and heavy producer Power Bud. Her parent strains are Northern Lights XL and a ruderalis strain that brought autoflowering genes into the mix. As an indica-dominant variety, her high is soothing, relaxing, and a great way to chill out in the evenings. However, a THC content of 14% is far from being too intense. It’s enough to offer a satisfying high without overwhelming new smokers. Northern Lights XL Autoflowering yields heavily, which makes her really worth the time and energy. Indoor plants put out yields of between 350–400g/m² and grow to heights of between 100–130cm. Plants grown outdoors within the elements provide growers with up to 230g/plant and achieve heights of up to 150cm. She has a harvest time of 60–70 days post-germination. 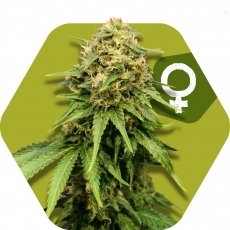 Green AK XL Autoflowering is one of the powerhouses of the autoflowering world. Usually, autoflowering strains can be a trade-off between speed of growth and size of yield. However, Green AK XL Autoflowering ticks both of these attractive boxes. With genetic foundations stemming from AK-47, this strain was birthed out of a breeding project involving parent strains Green AK XL and ruderalis. Her high is very chilled out and offers meditative vibes. THC values of 14% result in a mellow state of mind. Indoor plants only reach heights of between 60–90cm, yet offer relatively large yields of 400–450g/m². Outdoor plants grow to heights of between 70–110cm and produce up to 150g of flowers per plant. This strain zooms from seed to harvest in 60–70 days.